This guy is the last in the series of Raven Guard models I've been working on lately. The reason I'm sharing with this with you is because I think it hits on something I see more often than not in conversions people show me. You can click on either of the images below for larger versions. This is what the model looks like before he was primed... and the fix made. This model was converted, assembled and primed when I stopped and went back to fix a small part on him. I didn't notice how bad his left handed thunderhammer was while I was building it, but once I had it primed, the flaw stuck out like sore thumb. It wasn't much really and I could have passed it off as part of the "conversion" process. It would have saved me some work and nobody would have been the wiser for it. But I would have known and it would have bothered me. You see, this guy is wielding dual thunderhammers. They don't make a left handed thunderhammer. You have to convert a left handed one if you want one. So that's what I did, but it came out "visually" wrong. Don't get me wrong, the technical aspects are correct. The joint is pinned, greenstuff has been used to fill in gaps, textures have been added so that your eye skips over the seams and so on. But the left thunderhammer handle was about 3mm too short. I ended up carefully cutting away the attachment at the end of the handle and replacing it with a new piece that had the additional length to make it look "right." Makes a HUGE difference now. What's the point you ask? 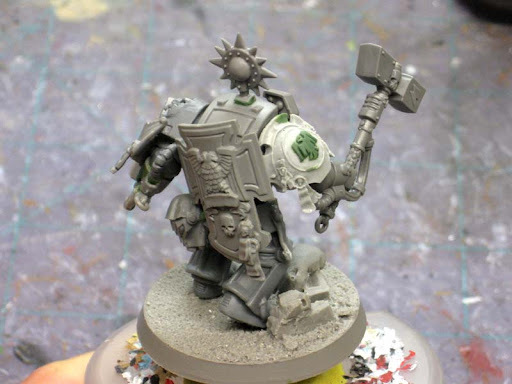 The point is this, if you're going to take the time to do a conversion to one of your models (or someone else's for that matter), do it right. Don't skip out on something in order to make it easier or to just get it done. Make sure you go the distance and do your best work on the entire thing, not just most of it. And you don't have to be a professional sculptor or painter either... I'm not talking about skill level here, I'm talking about doing the best you can. Conversions succeed or fail with the little details. If you don't take your time and make sure those little things are correct, you'll fail every time and your models will always end up looking "wrong." Agreed. Love the model, always wanted to do a dual TH model from the pic in the SM book. Can't want to see it painted! I really like that. Thinking in terms of attitude and putting your heart into what you do. I can't agree more! You really struck a cord with me here and I have the utmost respect for people who take the task seriously, be it music, software, manufacturing, or conversion/painting. Your conversions and painting are top notch, but the reason I read your blog is your passion. 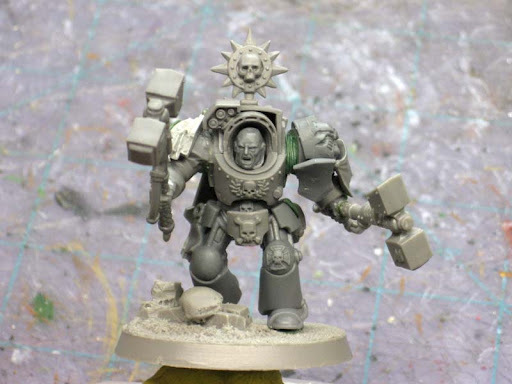 Looks like he doesn't just have dual thunderhammers but also a storm shield:) Is it inspiration from the picture on the chapter master entry in codex Space Marines or is there another source? I like the idea of having all the special HQs for your chapter but I guess some where skipped in this case. That said Raven Guard has two cool captains (the FW model is so nice!). I just wish they could post the official rules for the new captain in WD as well so the old "we don't play FW stuff" can't be played. We just want to play our minis after all. Kirby: I'm spending all morning sculpting icons for my Storm Warden squad but I'll be painting this guy up this weekend and posting pics of the finished model. Flekkzo: Thanks. As for where the idea came from, I built one of these based of the Fantasy Empire model a while back since I absolutely loved the pose (before you could actually do this with a 40k Codex) and then people have asked for various versions of it since then. This is the first one with the storm shield attached to his back though. As for using FW rules, I say go for it... if it makes your games that much more enjoyable, then why not? Can you even equip a guy with two Thunderhammers and a Storm Shield? 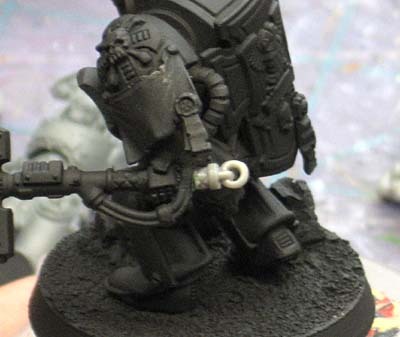 I love the model, but the shield on the back seems like... it should belong on some Vanguard somewhere instead of the back of a Terminator. Thats a great conversion! Can i ask where you found the donor left hand handle for the hammer?